Sexual harassment in the workplace has been ignored, tolerated, overlooked, and somehow perpetuated for years, decades and maybe centuries. It’s only now that we’re experiencing a dramatic cultural inflection, brought on by the courage of some women who were angry, frustrated, and tired of being held captive by their fear and shame. These women banned together in solidarity, and now they’re a force that grows stronger by the day. Since the demise of entertainment mogul Harvey Weinstein, the wave of people coming forward with their stories about sexual harassment has been nonstop. The accused are high profile figures whose careers have been dramatically affected, even ruined. At last, it’s changing our understanding of the risks and the seriousness of harassment. Whether it’s been weeks, months or years ago, this is just the tip of the iceberg. It seems that there’s not a day that goes by that another CEO, Hollywood elite, political figure or network star comes tumbling down. These cases won’t remain limited to the well-known names, though. This reckoning will affect other people and industries, too, and will spread to other forms of inappropriate and discriminatory behavior. For the moment, though, this is where it’s focused. 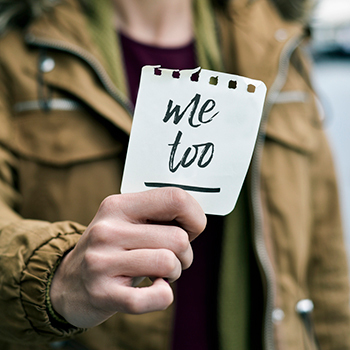 What’s common in all of these sexual harassment cases is that the accused are people of power who think they’re invulnerable and can do what they want–until they can’t. Right now, we’re hearing about people in high places, but power isn’t restricted to the corner office. Power occurs wherever and whenever someone in the workplace has a sense that they can control the career, destiny, or opportunities of another person and that gives them leverage. It’s the same dynamic, regardless of the workplace. The irony is that the people who do this honestly believe they’re invulnerable. The reality is they’re more vulnerable when news of their actions become public, and we all learn about it. Can you really change workplace behavior? The truth is, you can’t prevent all inappropriate conduct, but you can prevent a lot of it. The more realistic goal should not only be to prevent it but to surface instances and correct them quickly. That’s a cultural matter that requires leadership, commitment, persistence, and will. If you’re a Fortune 500 company, it starts with the Board and the CEO. And if it’s a small mom and pop company, it starts with you. Whether you’re big or small, it begins at the top. Having policies, procedures and rules in place is a great start, but talking about behavior is where your efforts should be focused. We can use the legal risks to help people understand why it’s important, but ultimately it’s about how to behave in the workplace. It’s not just the legal risks either; it’s reputation risks, organizational productivity risks, and sometimes the risk of life and death, especially in the way that improper discriminatory harassing behaviors occur. Some people are skeptical about the ability to control behavior in the workplace, but quite honestly, it’s done all the time. You control when people come and go, what they wear, and the work they do. Of course you can control their behavior. If you listen to every one of the companies that are in the news, in one way or another, they’ll talk about respect, inclusion, civility, and professionalism. The fact that they allowed these behaviors to occur, which are not respectful, professional, or inclusive, says that there’s a gap between what’s written and what’s being said. There needs to be a strong commitment that behavior will reflect the organizational values. Clients contact ELI for a variety of reasons. Sometimes it’s when they’ve already been through a major disaster, and they’re in crisis mode. “Can you fix this and repair the damage?” Of course ELI can help. Other companies call us because they want to prevent crisis mode. They want a workplace environment that drives productive behavior. They do this to affect their culture and to have an impact on their organization because their values mean something. ELI provides training, which has been recognized by the EEOC for the impact it’s had within the federal government, but we offer other related services that help build this civil treatment workplace. But, to achieve that, we need a commitment from senior executives. Companies must also understand the need for consequences. If you do all the things we teach without holding people accountable, you’ll fail. Eliminating the systemic is part of the process we work through. Companies will have to deal with issues from time to time, but they won’t be in crisis. Take time to look at your company’s culture and make sure there’s civility in the workplace before there’s an issue. 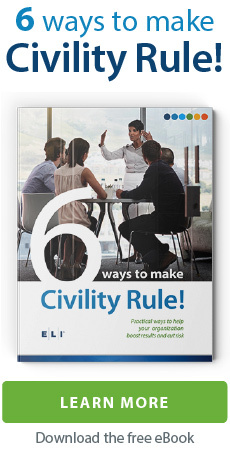 6 Ways to Make Civility Rule! provides practical ways to help your organization boost results and cut risk. Download your free copy today!